The new Abarth 695 Rivale hails from a collaboration between two Italian giants in the fields of technology and innovation. The special 695 was conceived in partnership with Riva Yachts. The iconic nautical brand, synonymous with Italian elegance and style, contributed to the creation of the most sophisticated Abarth ever. The Fiat Abarth 695 Rivale made its debut alongside the Riva 56′ Rivale yacht at the Riva boat yard to celebrate Riva’s 175th anniversary. 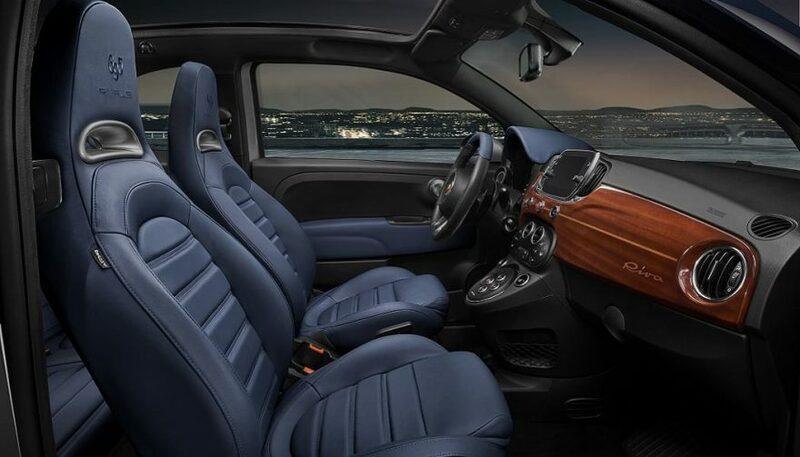 This ultra-limited edition accentuates handcrafted finishes by adding customized elements, special wheel rims, celebratory logos and hand-finished blue and black leather front seats. The Abarth 695 Rivale comes as a hatchback or cabriolet. You can recognize the car by its exclusive livery. This model shares its aesthetic affinity with the side grilles on the new Riva 56 Rivale. The two-tone Riva Sera Blue and Shark Grey paintwork, embellished with an aquamarine double stripe that runs the waistline, resembles the beauty line on the Riva yachts. The satin chrome molding on the rear evokes the shape of a yacht. 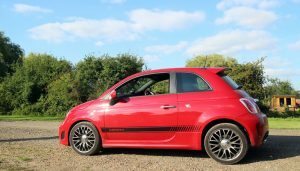 Certainly, it’s the kind of car that will make people stop, take note and ask, “What kind of Abarth is that?” It’s definitely a financial departure from the 695’s cousin the Fiat 500 Pop. The usual 1.4-liter turbocharged four-cylinder engine hides under the bonnet. However, this one is capable of 180 horsepower and 184 lb-ft of torque. 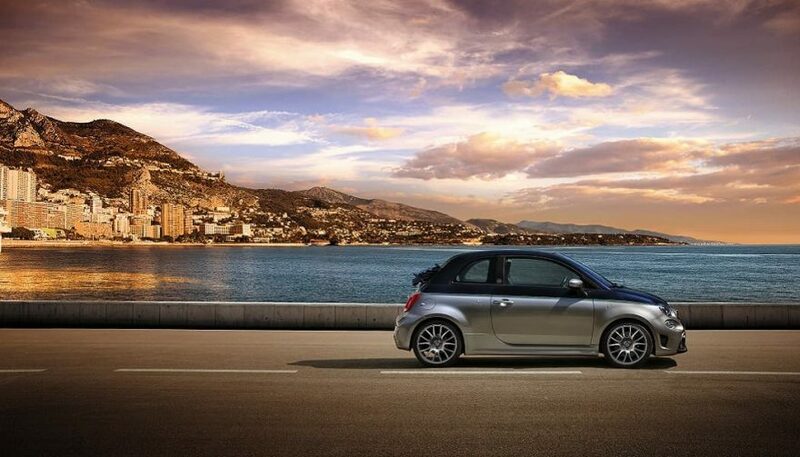 It won’t give you as good of fuel efficiency as the Fiat 500, but it will move you down the road at a nice clip. The power-to-weight ratio of the 695 Rivale is that of a real supercar. It has an equivalent of 12.8 pounds per horsepower. Abarth reports a maximum speed of 140 mph, with a 0-60 time of just 6.6 seconds. It’s a car that can satisfy sophisticated customers looking for elegance, sophistication and performance. Inside the car you can find many flourishes meant to give the car a nautical feel. You’ve got blue leather seats and door panels, and carbon fiber kick plates and dashboard. The dash also comes in real mahogany. The mahogany option allows owners to embrace the Riva aesthetic in greater depth. In addition to the dashboard strip, the special steering wheel is covered in blue and black leather with a mahogany badge. Also, there’s a blue leather instrument panel cover and mahogany gear lever knob. The technological content is also excellent. A Uconnect infotainment system with 7-inch HD touch screen comes standard. It is Apple CarPlay and Android Auto ready. The Abarth 695 Rivale has Brembo brakes with black, four-piston fixed calipers at the front. The 17-inch Supersport alloy rims are finished in a special gloss grey. There’s also a sophisticated and sporty Koni suspension system with FSD (Frequency-Selective Damping) technology. Finally, the Abarth character is clearly visible in the gloriously noisy Akrapović exhaust system, with carbon tail pipes. The Abarth 695 Rivale is an instant classic, adding to Abarth’s already enviable list of limited edition cars. Owners of this car can become part of the tight circle that is the Abarth Register, which only includes the most exclusive cars with the technical or historical requirements to make them true collectors pieces. Special to the 695 Rivale, there is also a hand-written numbered plate, which can be customized with the name of the owner’s matching yacht on request. It’s an original way of making the new Abarth 695 Rivale into a high performance land tender. 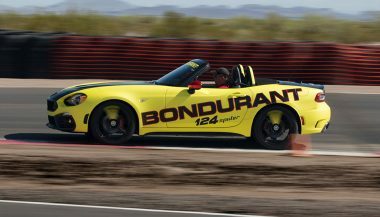 Fiat 124 Spider and 500 Abarth purchase and lease customers receive a free track day at the legendary Bob Bondurant School. 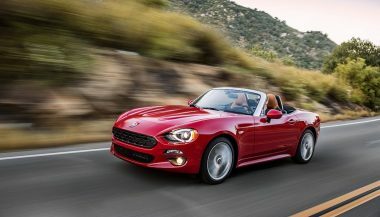 Fiat 124 Spider: It’s Hot but Is It a Fiat or a Mazda? They say imitation is the greatest form of flattery, but the new Fiat 124 Spider is almost a direct impersonation of the Mazda Miata.